We have been seeking ways to improve and support change, and I’m happy to say that a recent result was developing and implementing a set of design principles to guide decision-making at ABIM. The design principles are grounded in values we’ve gathered from the internal medicine community, and allow for members of the ABIM Board and Council to answer a key question as we move forward with future changes: “Did we get this right?” The principles are organized as short, aspirational and informative guidelines that give ABIM a framework for staying aligned with community values – which include important tenets, such as transparency, involving stakeholders, public interest and fidelity to the internal medicine community’s shared purpose. I look forward to updating you about further progress as we continue to review, consider and incorporate your feedback and re-examine the MOC program in partnership with the community. Shared purpose and impact first. Does the solution align with and advance the internal medicine community’s shared purpose and will it have the desired impact on the community? Patients are the North Star. How does the solution align with the public interest? How is it good for patients? Simplicity and relevancy. Are the solutions easy to understand and applicable to many in the community? Are they relevant? Are they attentive to the burden on and benefit to physicians? Think internal and external. Have both internal and external stakeholders contributed to the solution? Has the impact of the solutions on ABIM and the community been considered? Always include the WHY, the HOW, and the WHO. Will the community understand ABIM’s decision and how it was reached? 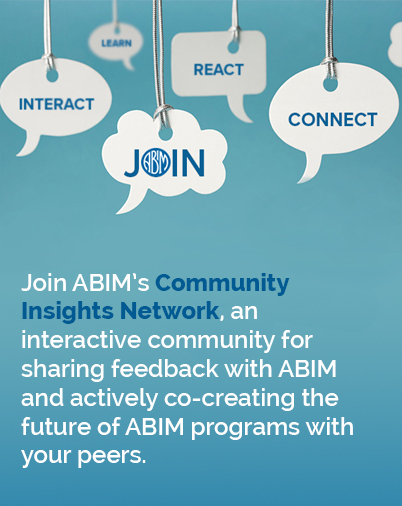 Balance community-centered design with ABIM’s expertise and research. Have the expert decision makers given appropriate consideration to the possible solutions that emerged from the community? Participation, not just communication. Did ABIM develop solutions with the community and not for them? Will they believe that they had a role in developing the solution? Transparent decisions. Can ABIM easily explain why a particular decision was made and why another possible solution was rejected?